As the age old Real Estate aphorism goes it’s all about Location, Location, Location! With “Advertising spend at £23.12 per mobile internet user in the UK in 2012” (eMarketer, 2013), “smart phone sales at 491.4 million units in 2011” (IDC, 2012), and “45% of internet users using mobile phones to connect to the internet” (ONS, 2011) mobile is no longer a marketing channel that can be ignored. One important factor for the cause of this drive is that, mobile brings elements of immediacy, relevance, drive, and impulse given the location of the consumer when targeted by the marketers. This ecosystem is rapidly developing, and leaving behind a haze of confused companies on how to allocate their budgets. They are increasingly becoming aware of the necessity behind a mobile campaign, but are uncertain of where to begin, how to manage, and how to measure ROI. In efforts to give a clear direction on where to initiate mobile marketing campaigns Mobile PPC is a great place to start. There are many reasons to begin a company’s mobile marketing strategies with Paid search, for one thing it does not require exuberant budget allocations and can be set up rather quickly. Another case to begin with mobile PPC is that studies show, “70% of mobile paid searches result end in action within an hour” (wells, 2012). Meaning that 70% of paid search ads that are clicked by a mobile user, are called, emailed, or visited within an hour of the search. Finally “mobile search costs can be managed to just a fraction of computer-based search costs” (Kahn, 2011). This is primarily due to the fact that the keyword CPC for mobile channels are less competitive, and therefore lower then desktop. First and foremost a mobile optimized website is key to any successful initiations into mobile strategies. It is important to keep basic “cleanliness”, before adding another campaign or it will all fail. This is reiterated time and time again, however studies show that “98% of websites don’t have any mobile optimized content” (marketable mobile, 2012). Some important aspects that composes an optimized mobile version of a website are the following: no unnecessary scrolling, make the mobile goals of your website visible upon entry (Directions, phone number, purchase), keep the design simple, don’t use large graphic files to avoid long load times, and create the mobile website for multiple handset devices. It is important to manage mobile paid search campaigns separately from desktop campaigns. First it will save money, and more efficiently utilize the budget. As mentioned previously average CPC for mobile is a fraction of its desktop counterparts cost. Also mobile “differs from regular search in that it appeals to prospects who are on-the go and actively searching for a product or service” (Turner, 2012). Mobile Marketing experts “criticism, is focused largely around the tendency of most marketers to apply on-line display mentality to advertising on this smaller screen rather than thinking creatively about the differences in the manner that consumers use this device” (Ricci, 2012). This brings the focus to the next point, screen size. A major factor to note in the mobile screen size is the number of bids that can be shown versus that of a desktop. On a desktop there is an average of about six text ads that can be seen for a particular search query, while on mobile the average is one. In managing the mobile PPC campaign separately, the company can attempt to take the first average position of the text ad. This can easily be assessed and altered by increasing or decreasing bid for clicks. Leading the topic to the next factor of mobile specific keywords. An important element of mobile keyword selecting is to keep in mind the difference in intent for mobile searches compared to desktop. Based on the expected user search intention the Keyword might be different. For example if the company is a brick and motor store, and wants to drive more foot traffic having a keyword to include “nearest X store to Covent Garden” could help mobile users find the store while actively out and searching. This will then prompt your advertisement to appear for that particular intent. Think of the goal of the company, and what a potential customer might be searching for that correlates to what the company offers. A major concern that comes hand in hand with mobile marketing campaigns is the uncertainty of how to measure ROI. eMarketer reported, after a study conducted that 63 % of mobile campaigns are not measured because marketers are not trying or don’t know how to measure(2011). Again as the mobile channel for marketing is a fairly new concept, there is a lack of industry standards on how to measure these campaigns. 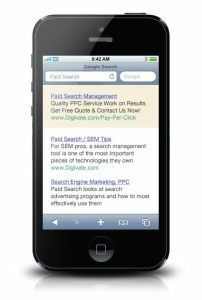 Mobile PPC offers a high measurability if managed correctly, and can be easily calculated to find the ROI. Both analytics and ad server platforms are tools that can be used to measure both the cost and revenue earned from a specific campaign. To increase the ROI it is prudent to customize the ad copy text for the “mobile user intent” identified previously. Ensure to keep the text relevant to what the user might be looking for. For example having a call to action phrase like “call now” with the phone number in the text, or “find your nearest” with a landing page for directions to locations. Keep in mind the marketing objective of the PPC campaign. A function that is unique to the mobile channel is the ability of targeting consumers that are close by, and most likely out actively searching to purchase. This is why it is important to target potential consumers within a close range, at the moment of the search inquiry. On the ad server platform marketers can create target specifications with a desired radius for a specified address or map co-ordinates. This enables the company to create relevant ads with a strong immediate response aspect. Marketers can also target specific operating systems, device models, and different operators, with an option to include WI-FI locations.